With the recent advent of the IUPAC Poster Prize program, National Adhering Organizations and eligible IUPAC-sponsored conferences gained a strategic tool to encourage interest in conferences among young chemists. The Poster Prizes recognize outstanding poster presentations at IUPAC Congresses, at IUPAC division/standing committee-sponsored conferences, and at designated national meetings. Each NAO may pick one conference a year at which to award IUPAC Poster Prizes. As explained by the secretary general David StC. Black in his column in the January-February 2005 CI (p. 2), division or standing committee-sponsored, or so-called “core,” conferences are specifically driven by IUPAC divisions and standing committee to the extent that they take responsibility for ensuring the continuity of a series. This usually means that the committee is involved in the selection of the organizers and the location of future conferences to ensure geographical diversity. The committee may also review the conference program, help select the plenary and invited lecturers, and assist in terms of promotion. With these guidelines in mind, divisions and standing committees benefit from the Poster Prizes program because it provides an extra incentive to maintain IUPAC’s relationship with recognized conferences throughout the world. Conferences sponsored by IUPAC and national meetings of NAOs also benefit by being able to offer a prize that is associated with IUPAC, which often bolsters the participation in and credibility of a meeting. 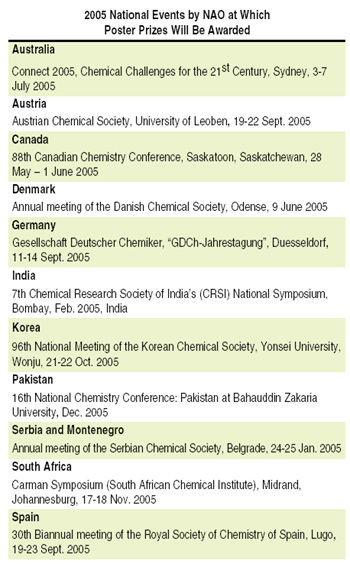 The IUPAC Poster Prizes program was implemented in 2004 following a suggestion from President Leiv Sydnes. The Executive Committee officially approved the program at its meeting in April 2004. It was felt that implementing such a program would benefit IUPAC and provide incentives to younger chemists to attend conferences they might not otherwise attend. The program will also serve as a means for recognizing IUPAC’s international activities. Each eligible conference that chooses to implement the IUPAC Poster Prizes typically awards two prizes. The conference organizers oversee the selection of prizewinners. Each prize recipient receives a certificate signed by the IUPAC president, a copy of the Gold Book (Compendium of Chemical Terminology), and a two-year subscription to CI. In 2004, prizes were awarded at four international conferences and four national meetings even though the program was only initiated in mid-July. The astute reader of CI might have noticed mentions of these poster prizes in recent issues. The 2004 recipients, all listed in the table below, are congratulated for their poster presentations. Starting with this issue of CI, each IUPAC-sponsored conference eligible to award poster prizes will be flagged in the Mark Your Calendar section, as well as online. Over the most typical two to three-year cycle, no less than 27 “core” series will be eligible to award IUPAC poster prizes. Details and guidelines can be found at <www.iupac.org/news/archives/2004/poster_prizes.html>. Page last modified 21 April 2005.